Shell fishes like crustaceans and molluscs are often prone to shell diseases. Among crustaceans, crabs, lobsters and shrimps are largely infected by infectious pathogens and various environmental stresses. Viruses are commonly seen in shells of shrimps, whereas dinoflagellate is predominant in lobsters. Crabs are infected in higher extend than any other crustacean. Shell disease syndrome in brachyuran crabs is characterized by damaged external manifestation of colored lesions in the exoskeletons. Bacteria (Vibrio, Pseudomonas and Aeromonas), viruses (WSSV), fungi (yeast) and several other pathogens influence the higher percent of shell disease in crabs. Crabs with shell diseases are prone to internal damages causing variation in haemocyte counts and histopathological alteration in internal tissue and organs. Infections in crab may lead to great economic loss. This review discusses about the causes, types, histopathology, genetic variability, hematology, humoral defense mechanism and host susceptibility hypothesis of brachyuran crab shell diseases. Brachyurans (Linnaeus, 1758), the true crabs contain more than 6500 species and is the largest clade of the decapods crustacean. The brachyuran crabs have a high scientific and economic value. They also possess anti-microbial, anti-leukemic, anti-coagulant and cardio active properties. They are also used as tools in drug action mechanisms. Shell disease syndrome is the progressive degradation of the cuticle and is characterized by the appearance of the black and white spot lesions and pale coloration in the exoskeleton surface. The black coloration of the lesions is a result of melanisation, defense response triggered by cuticular damage (Nyhlen and Unestam, 1980). Exoskeleton erosion is largely attributed to the chitinolytic activities of microorganisms. Lesion initiation requires removal of the outermost, non-chitin-containing layer of the cuticle and may occur by lipolytic microbial activities (Cipriani et al., 1980), predatory or cannibalistic attacks (Dyrynda, 1998), chemical attack or the abrasive action of sediment or articulated body parts (Young, 1991). Pathogenic microbes have been identified from different parts of various crustaceans and factors causing damage to crustaceans were also analyzed. Occurrence of pathogenic bacteria in gills, skin and buccal cavity of Lutjanus agennes, Pseudotolithu s elongatus and Sphyraena barracuda were proven (Akinyemi and Buoro, 2011). Presence of bacteria in mud crab Scylla serrata from Malaysia was also reported (Najiah et al., 2010). Antibacterial activity of brachyuran crabs like Scylla serrata, S. tranquebarica, Nanosesarma minutum, Neoepisesarma tetragonum, Metapograpsus maculates and Macrophthalmus depressus (Veeruraj et al., 2008) and in fishes (Ravichandran et al., 2010c) were determined. Krishnika and Ramasamy (2012) have demonstrated that Artemia sp. cysts carry pathogenic bacteria like Vibrio spp. in their shell and have initiated ways to eliminate them. Nutritional quality (Sudhakar et al., 2011) and heavy metal accumulation has also been studied in brachyuran crabs (Kamaruzzaman et al., 2011). Very few studies were known to have conducted detailed research on shell diseases caused by chitinolytic bacteria and other pathogenic microbes in these crustaceans especially in brachyuran crabs. The shell disease may be categorized in to two stages, Firstly, lesion initiation, which involves removal of the externally situated non-chitinous epicuticle, may be the result of abrasive damage (Vogan et al., 1999), fighting injuries (Dyrynda, 1998), chemical attack or a bacterial degradation (Cipriani et al., 1980). Secondly, lesion development and dissolution of the underlying procuticle is thought to proceed largely via the liberation of extracellular chitinase from epibiotic microorganisms (Stewart, 1993). The disease is not believed to be fatal in its initial stages but may turn lethal causing adhesion of successive moult shells at lesion sites leading to incomplete withdrawal from the exuviate at moult. It is suggested by Baross et al. (1978) that haemocoelic infections by pathogenic bacteria originating by entry through the lesion site may also lead to death. Though there are numerous studies carried out by many authors related to the shell diseases of brachyuran crabs, there is no cumulative paper on histopathology, genetic variability, hematology and humoral defense mechanism. The incidence of shell disease in natural populations of crustaceans is very low. When cultured together, a high incidence occurs may be due to mechanical damage. The crab shell diseases are associated with infectious agents like bacteria, virus, fungi, dinoflagellates, protistans, ciliates, metazoans and foulers. Majority of them are linked with bacteria, while fungi are occasionally involved in shell diseases (Sindermann, 1989; Prince et al., 1993; Hameed, 1994). Parasitic infestations in fin fishes were reported in South-East Coast of India while shell fishes were merely considered for infection. Plenty of works support visible infestation by parasites in fin fishes in India (Ravichandran et al., 2010a, 2011; Trilles et al., 2011). Exoskeleton or cuticle of crustaceans is made up of thin proteolipoidal material. Cipriani et al. (1980) suggests that lipoidal nature of the epicuticle may induce micro-organisms producing extracellular lipase to initiate lesions. Meyers et al. (1987) reported bacteria and unidentified ciliate parasites in the haemolymph and phagocytes of the hepatopancreas of Hematodinium- infected crabs. Arcier et al. (1999) investigated the occurrence of secondary bacterial infections in invertebrates, particularly for virus-infected crustaceans under aquaculture conditions. Shell diseases are characterized by various types of erosive lesions on carapace (Johnson, 1983; Sindermann and Lightner, 1988). Black spot and white spot lesions are some of the classic and common shell diseases in brachyuran crabs (Fig. 1) which are characterized by various-sized foci of hyper pigmentation (Rosen, 1970; Noga et al., 2000; Vogan and Rowley, 2001; Vogan et al., 2002). Among crabs of Indian waters Scylla spp. are reported to have more infections by bacteria and virus. The most common bacteria causing shell diseases in crabs are Vibrio and Pseudomonas (Getchell, 1989). A new type of shell disease, rust spot syndrome (Fig. 2) has been reported in Scylla serrata (Forskal) in Port Curtis, Queensland (Andersen et al., 2000). WSSV (White Spot Syndrome Virus) infects the shells of marine and fresh water crabs equally (Hameed et al., 2003; Islam et al., 2007). Other pathogens like fungi, dinoflagellate, protistans and foulers are also reported to infect brachyuran crabs (Table 1). Bacteria: Heavy bacterial growth has been observed both in normal as well as in shell diseased carapace of crabs like Cancer pagurus (Linnaeus), Callinectes sapidus (Rathbun) (Table 2) and S. serrata. Among Vibrio, Pseudomonas and Aeromonas, Vibrios are predominant in high salinity sites whereas Pseudomonas and Aeromonas are common in low salinity sites. Natural feed such as trash fish, molluscs, farm waste etc facilitate the entry of microbial pathogens in ponds. Molecular identification of shell disease causing bacteria was done in India in the ecologically important mangrove crab, Neoepisesarma mederi and presence of chitinolytic bacteria like Aeromonas and Pseudomonas were confirmed to be the cause for the shell infection. The disease also caused secondary infection which resulted in abnormality in haemocytes count, proximate composition and histopathology of the animal (Sharmila, 2011). Virus: WSSV (White Spot Syndrome Virus), TSV (Taura Syndrome Virus), YHV (Yellow Head Virus) are the most commonly described viruses affecting the shells of crustaceans. Brachyurans with only White Spot Syndrome Virus (WSSV) are identified. Secondary bacterial infections are also seen in virus infected crustaceans. Fungi: Dinoflagellate (Hematodinium sp.) infection causing Pink Crab Disease (PCD) in Cancer pagurus and Necora puber ( Linnaeus) suffered with a systemic co-infection of yeast like organism (Stentiford et al., 2003). Dinoflagellate: Infection of Hematodinium, a Dinoflagellate parasite is seasonal and also amplified by abiotic factors. Infection peaks result in sporulation (Stentiford and Shields, 2005; Hamilton et al., 2009). Bitter Crab Disease (BCD) caused by the dinoflagellate, Hematodinium sp. is predominant in snow crab, Chionoecetes opilio (Fabricius) (Gottfried et al., 2003) and tanner crabs Chionoecetes bairdi (Rathbun) in the subarctic waters of Newfoundland and the Bering Sea (Meyers et al., 1990; Eaton et al., 1991). The disease is also seen in some populations of blue crab Callinectes sapidus by H. perezi and occurs well after main moulting period (Messick, 1994; Shields, 1994; Shields and Squyars, 2000; Messick and Shields, 2000). Pink Crab Disease (PCD) caused by the Hematodinium like parasitic dinoflagellate in Cancer pagurus from Ireland and from the English Channel and is characterized by hyper-pigmentation of carapace and appendages (Stentiford et al., 2002). Hematodinium infection was also detected in Cancer pagurus, Carcinus maenas (Linnaeus), Liocarcinus depurator (Linnaeus) and Necora puber from the Clyde Sea in Scotland (Hamilton et al., 2009). Foulers: Carapace fouling organisms are identified in the exoskeleton of Cancer pagurus and are described by Holt (1890). Several species of spirorbid polychaete (Janua pagenstecheri, Spirorbis rupestris and S. tridentatus) have also been described as inhabiting the external carapace of C. pagurus (Knight-Jones and Knight-Jones, 1977). Several cirripede crustacean species (barnacles) like Balanus balanus (Linnaeus), B. crenatus (Bruguiere), Chelonibia patula (Ranzani), Chirona hameri (Ascanius), Elminius modestus (Darwin) and Verruca stroemia (Muller) inhabit the carapace of intermoult C. pagurus (Richard, 1899; Heath, 1976). Molluscs are identified on the carapace of C. pagurus which include the saddle oyster Anomia sp. and the common whelk Buccinum undatum (Renouf, 1932; Ingle, 1996). Renouf (1932) and Ingle (1996) has explained about bryozoan infestations by Scruparia chelata in C. pagurus. A positive correlation is found between shell disease and degree of infection (Fig. 3). Bacteria are seen prominently within the body cavities of healthy crustaceans (Colwell et al., 1975; Sizemore et al., 1975; Ueda et al., 1993). The existence of bacteria in the body cavity has apparent detrimental effects such as higher percentage of limb loss on the affected part of the animal. Haemolymph infection frequently co-occurs with limb loss and this suggests a potential route for microbial entry. Bacteria can enter in to the haemocoel through breach of the cuticle either at the gill lamella or through other external lesions. Severe internal damage is associated with crabs with higher external damage in regions surrounding the branchial chambers (Vogan et al., 1999; Vogan and Rowley, 2001). Number of free haemocytes vary and decrease dramatically during an infection (Persson et al., 1987; Smith and Soderhall, 1983; Smith et al., 1984; Lorenzon et al., 1999). It is believed that the haemocytes will be continuously produced but at varying rates. Haematopoietic tissue producing new haemocytes has been identified in several crustacean species (Ghiretti-Magaldi et al., 1977; Hose et al., 1992; Martin et al., 1993; Chaga et al., 1995). Shell disease (Rust spot shell disease) of non-infectious nature has been reported in Scylla serrata from Australia is characterized by irregular lesions and unique histopathological alterations (Andersen et al., 2000). Non-diseased animals have found to have 0.05% of their body surface covered with shell disease lesions (named as superficial minor infections). 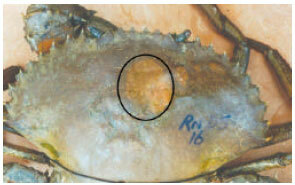 Distinct histological changes in the gill were observed in crabs with shell disease lesions on their body surface. In particular, lesions appeared on the outer surfaces of the lamellae and haemocyte accumulations (nodules) were observed occluding the haemal sinuses at such sites. All gills from shell disease-affected crabs showed distinct changes to the nephrocytes found in the central blood sinus. These cells were enlarged and filled with brown pigment (Fig. 4). In some cases greater numbers of haemocytes, particularly eosinophilic granular cells, were found in association with the nephrocytes (Vogan and Rowley, 2001). Shell-diseased animals showed varying degrees of necrosis of their hepatopancreatic tubules. It is reported by Vogan and Rowley (2001) that the degree of tubular damage was not uniform within the hepatopancreas. The sections from individual crabs contained tubules apparently in different stages of epithelial cell breakdown and the hepatopancreas of crabs with greater degree of external lesions was found to contain more damage than that of less affected crabs. Vogan and Rowley (2001) showed that the crustaceans with shell disease also possessed damages in internal organs. There was a linear relationship between the bacterial load in the haemolymph and the severity of shell disease. This study (Vogan and Rowley, 2001) also revealed breakdown of the hepatopancreas and damage to the gills associated with nodule formation due to haemocyte clumping. A contrary to this, study of Vogan et al. (2002) had no clear effects on haemocytes count, PPO (Prophenoloxidase) activity and no changes were found in the immune parameters of the shell diseased crab. A dinoflagellate, Hematodinium perezi is a significant threat to Callinectes sapidus (blue crab) fisheries in high-salinity estuaries. Although the parasite infects male and female crabs, it may have a greater impact on mature females as they move to higher salinities to breed. Haemocyte densities declined precipitously and exhibited differential changes in subpopulations of granulocytes and hyalinocytes in infected blue crabs and lasted throughout the course of infection (Shields and Squyars, 2000). The haemocyte count can vary greatly in response to infection (Fig. 5), environmental stress and endocrine activity during moulting cycle (Smith and Ratcliffe, 1980; Persson et al., 1987; Smith and Johnston, 1992). The presence of white spot syndrome virus (WSSV) in two species of freshwater crabs, Paratelphusa hydrodomous and P. puloinata was confirmed by genetic and histological analysis (Hameed et al., 2001). PCR confirmation (single-step and nested) of gills, head tissue, heart, muscle and eye stalk for the WSSV injected Indian crabs (Table 3) was reported by Hameed et al. (2003). PCR amplification of the first internal transcribed spacer (ITSI) region of ribosomal DNA and flanking 3 end of the small subunit (SSU) was done by Stentiford et al. (2002) which amplified a 680 bp PCR product in crabs with the symptoms of PCD (Pink crab disease) while in others there was no amplification (Fig. 6). The patterns of morphological and genetic variability of many crabs including Carcinus maenas, Scylla serrata (mud crab) and population studies of species like Callinectes sapidus (blue crab) are studied (Brian et al., 2006; Fratini and Vannini, 2002). Both genetic and geographical differentiations studies may pave a new way for the identification of the variation in the shell diseased crabs and their genetic impact. The genetic influence of shell disease in brachyuran crabs can be studied for the more confirmation and detailed information of the infection. Melanization reaction is the defense response triggered by cuticular damage in crustaceans (Lee and Soderhall, 2002). As the disease progresses, degradation extends into the lower layers of the cuticle, the pro-cuticle spreading outwards causing many of the smaller lesions to unite (Smolowitz et al., 1992). If the lesions penetrate into soft underlying tissue, secondary infection occurs through the ruptured cuticle and can result in mortality (Vogan and Rowley, 2001). Marine crustaceans are reported to have exoskeletons with approximately 70% of the organic fraction being chitin (Brimacombe and Webber, 1964). Hence, microbial chitinases are widely believed to be vital to shell disease lesion progression, at least in the classical form of the disease. Culturable marine microbial chitinoclasts include species within the genera Vibrio, Photobacterium, Aeromonas, Alteromonas, Pseudoalteromonas, Clostridium, Cytophage and Chromobacteria as well as actinomycetes and fungi (Gooday, 1990; Vogan et al., 2002; Costa-Ramos and Rowley, 2004; Bhattacharya et al., 2007). Although there are reports of chitinolytic fungal infections of the crustacean cuticle (Noga et al., 2000), bacteria are the most commonly cultured microorganisms from the shell disease lesions (Noga et al., 2000; Porter et al., 2001; Vogan et al., 2002; Chistoserdov et al., 2005). Variation in degree of infection is seen in crabs of natural habitat, impounded population, aquaculture and degraded habitats. Stressors such as inadequate nutrition, temperature extremes are considered to be major cause of shell infection. Another insight of possible importance is that some conditions referred to as shell disease might have a more direct relationship to environmental pollutants and their biochemical effects. Shell diseases are not related to all the effects of chitinolytic microorganisms. Less persistent pesticides like diflubenzuron (Dimlin) could result in contamination of coastal/estuarine waters and damage to shells by interference with chitin synthesis. An example for this is exposure of fiddler crabs, Uca pugilator to diflubenzuron showed blackened lesions on regenerating appendages (Weis et al., 1987). It is suggested by Young and Pearce (1975) that the lesions reflected a deficiency in chitin formation but they showed a resemblance to shell diseases. Activity of stressors in the environment especially in high population densities, abnormal temperatures and salinities, presence of toxic chemicals act to disturb metabolic processes and internal defense mechanisms of the species. Lesions most commonly occurred on the dorsal carapace for both sexes. The predominance of lesions to the posterior of the carapace coupled with highest severity in this region suggests that abrasion of the epicuticle may occur as the crab burrows backwards in the sediment. This hypothesis is further supported by the majority of lesions on the walking legs occurring on the ventral surface of the coax. The upper layers of sand sediment are known to support the highest number of chitinoclastic organisms (Hood and Meyers, 1973) and the chitin-rich material is rapidly colonized by microbes (Gooday, 1990). The crabs with the shell disease lesions and varying degrees of bacterial septicaemia also displayed differences in the haemogramme, haemolymph phenoloxidase activity, total protein, copper and urea, as well as haemolymph-derived antibacterial activity, compared to uninfected individuals (Vogan et al., 2002). Crustaceans possess one of the more advanced invertebrate immune systems and have both cellular and humoral defense systems. Haemocytes are involved in phagocytosis of external material, confinement of pathogens by clotting, coagulation, hardening (tanning) of the cuticle and encapsulation (Noga et al., 2000). Haemocytes are also associated with humoral systems such as the phenoloxidase, prophenoloxidase systems, bactericidins and lectins (Takahashi et al., 1995; Kopacek et al., 1993). Haemocytes are classified into hyaline, semi-granular and granular cells. Hyalinocytes are found to be associated with initiation of haemolymph coagulation (Aono and Mori, 1996) and phagocytosis in some species (Bell and Smith, 1993). Granulocytes are larger in size and are actively associated with phagocytosis in crustaceans and possess lysosomal enzymes which are important in immune defense system of the host. Drastic reduction in circulating haemocytes maybe indicative of disease, stress or starvation and so the haemocytes can be useful in assessing the overall health of the animal (Noga et al., 2000). Antimicrobial lipids from the hemolymph were isolated from brachyuran crabs in India which explains compounds exhibiting immune activity in haemolymph of crabs (Ravichandran et al., 2010b). Humoral defense mechanism of the shell diseased Cancer pagurus is reported to be affected. Severity of shell disease in the edible crab, Cancer pagurus, correlates with an increase in haemocoelic bacterial infections and may therefore serve as an external marker for the internal health of the animal. A strong correlation was found between the severity of shell disease and a reduction in serum protein, which was further indicative of haemocoelic infection. Levels of copper, urea, phenoloxidase and antibacterial activity in the haemolymph showed no correlations with the proportion of exoskeletal lesion cover. The degree of melanisation of haemolymph samples taken from shell-diseased individuals was less than that seen in disease-free crabs. Total haemocyte counts were unaffected by the disease, although some minor changes were found in the differential counts. Overall, despite having intra-haemocoelic infections, shell disease-affected individuals few changes in the cellular or humoral defense parameters examined (Vogan et al., 2002). Crustaceans constitute a major constitute in shellfish culture. Crabs are economically important in several ways. The bio-polymer chitin isolated from carapace of crabs is exported and they support the economic development. They are also useful to humans as most of them are edible. Crabs are the highly infected to cause shell diseases when compared to other crustaceans. Crabs like Cancer pagurus, Scylla serrata and Callinectes sapidus were reported to have more infections when compared to other crabs. This may be due to their mode of living like habitat, feeding and burrowing activities. Bacteria like Vibrio, virus like WSSV (white spot syndrome virus) and dinoflagellate like Hematodinium are reported to be affected by carapace erosion, pale colouration, hyper pigmentation and spot syndromes. Bacteria are found to cause more infections especially chitinoclastic bacteria which degrade the polymer chitin and result in erosion. This deepens and considerably infects haemolymph and tissues too. Infection in gills seriously affects respiration of the crab. Certain infections are too tedious and may even lead to lethality. The infection is also thought to be caused due to mechanical damage of crabs in densely populated areas, environmental stress like climate and temperature. Akinyemi, A.A. and O.O. Buoro, 2011. Occurrence of bacteria found in gills, skin, buccal cavity of Lutjanus agennes, Pseudotolithus elongatus and Sphyraena barracuda from Lagos Lagoon, Nigeria. J. Fish. Aquat. Sci., 6: 555-562. Andersen, L.E., J.H. Norton and N.H. Levy, 2000. A new shell disease in the mud crab Scylla serrata from port curtis, queensland (Australia). Dis. Aquat. Org., 43: 233-239. Aono, H. and K. Mori, 1996. Interaction between haemocytes and plasma is necessary for hemolymph coagulation in the spiny lobster, Panulirus japonicas. Comp. Biochem. Physiol., 113: 301-305. Arcier, J.M., F. Herman, D.V. Lightner, R.M. Redman, J. Mari and J.R. Bonami, 1999. A viral disease associated with mortalities in hatchery-reared postlarvae of the giant fresh water prawn Macrobrachium rosenbergii. Dis. Aquatic Organisms, 38: 177-181. Ayre, P. and E. Edwards, 1982. Notes on the distribution of black spot shell disease in crustacean fisheries. J. Chem. Ecol., 1: 125-130. Baross, J.A., P.A. Tester and R.Y. Morita, 1978. Incidence, microscopy and etiology of exoskeleton lesions in the tanner crab, Chionoecetes tanneri. J. Fish. Res. Board Can., 35: 1141-1149. Bell, K.L. and V. Smith, 1993. In vitro superoxide production by hyaline cells of the shore crab Carcinus maenas. Dev. Comp. Immunol., 17: 211-219. Bhattacharya, D., A. Nagpure and R.K. Gupta, 2007. Bacterial chitinases: Properties and potential. Crit. Rev. Biotechnol., 27: 21-28. Brian, J.V., T. Fernandes, R.J. Ladle and P.A. Todd, 2006. Patterns of morphological and genetic variability in UK populations of the shore crab, Carcinus maenas. J. Exp. Mar. Biol. Ecol., 329: 47-54. Brimacombe, J.S. and J.M. Webber 1964. Mucopolysaccharides. In: Chemical Struction, Distribution and Isolation. B.B.A. and E. Buddecke (Ed.). Elsevier, Amsterdam. Chaga, O., M. Lignell and K. Soderhall, 1995. The haemopoietic cells of the freshwater crayfish, Pacifastacus leniusculus. Anim. Bio., 4: 59-70. Chen, L.L., C.F. Lo, Y.L. Chiul, C.F. Chang and G.H. Kou, 2000. Natural and experimental infection of white spot syndrome virus (WSSV) in benthic larvae of mud crab Scylla serrata. Dis. Aquat. Org., 40: 157-161. Chistoserdov, A.Y., R. Smolowitz, F. Mirasol and A. Hsu, 2005. Culture-dependent characterization of the microbial community associated with epizootic shell disease lesions in American lobster, Homarus americanus. J. Shellfish Res., 24: 741-747. Cipriani, G.R., R.S. Wheeler and R.K. Sizemore, 1980. Characterization of brown spot disease of gulf coast shrimp. J. Invertebr. Pathol., 36: 255-263. Colwell, R.R., T.C. Wicks and H.S. Tubiash, 1975. A comparative study of the bacterial flora of the hemolymph of Callinectes sapidus. Mar. Fish Rev., 37: 29-33. Costa-Ramos, C. and A.F. Rowley, 2004. Effects of extra cellular products of Pseudoalteromonas atlantica on the edible crab, Cancer pagurus. Appl. Environ. Microbiol., 70: 729-735. David, W.C. and S.R. Lofton, 1973. Chitinoclastic bacteria associated with shell disease in Penaeus shrimp and the blue crab (Callinectes sapidus). J. Wildlife Dis., 9: 154-159. Dyrynda, E.A., 1998. Shell disease in the common shrimp Crangon crangon: Variations within an enclosed estuarine system. Mar. Biol., 132: 445-452. Eaton, W.D., D.C. Love, C. Botelho, T.R. Meyers, K. Imamura and T. Koeneman, 1991. Preliminary results on the seasonality and life cycle of the parasitic dinoflagellate causing bitter crab disease in Alaskan tanner crab (Chionoecetes bairdi). J. Invertebr. Pathol., 57: 426-434. Escobedo-Bonilla, C.M., V. Alday- Sanz, M. Wille, P. Sorgeloos, M.B. Pensaert and H.J. Nauwynck, 2008. A review on the morphology, molecular characterization, morphologenesis and pathogenesis of white spot syndrome virus. J. Fish. Dis., 31: 1-18. Fratini, S. and M. Vannini, 2002. Genetic differentiation in the mud crab Scylla serrata (Decapoda: Portunidae) within the Indian Ocean. J. Exp. Mar. Biol. Ecol., 272: 103-116. Getchell, R.G., 1989. Bacterial shell disease in crustaceans: A review. J. Shellfish Res., 8: 1-6. Ghiretti-Magaldi, A., C. Milanese and G. Tognon, 1977. Hemotopoiesis in crustaceans decapoda: Origin and evolution of hemocytes and cyanocytes of Carcinus maenus. Cell Differ., 6: 167-186. Gooday, G.W., 1990. The ecology of chitin degradation. Adv. Microb. Ecol., 11: 387-430. Gopalakrishnan, A., M. Rajkumar, J. Sun, M. Wang and K.S. Kumar, 2011. Mud crab, Scylla tranquebarica (Decapoda: Portunidae), a new host for the white spot syndrome virus. Aquacult. Res., 42: 308-312. Gottfried, P.P., D.M. Taylor, J.M. Hoenig, J.D. Shields and R. Pickavance, 2003. Monitoring the prevalence of the parasitic dinoflagellate Hematodinium sp. in snow crabs Chionoecetes opilio from conception bay, newfoundland. Dis. Aquat. Org., 53: 67-75. Hameed, A.S.S., 1994. Experimental transmission and histopathology of brown spot disease in shrimp (Penaeus indicus) and lobster (Panulirus homarus). J. Aquac. Trop., 9: 311-321. Hameed, A.S.S., G. Balasubramanian, S.S. Musthaq and K. Yoganadhan, 2003. Experimental infection of twenty species of Indian marine crabs with white spot syndrome virus (WSSV). Dis. Aquat. Org., 57: 157-161. Hameed, A.S.S., K. Yoganandhan, S. Sathish, M. Rasheed, Murugan and V.K. Jayaraman, 2001. White spot syndrome virus (WSSV) in two species of freshwater crabs (Paratelphusa hydrodomous and P. pulvinata) Aquaculture., 201: 179-186. Hamilton, K.M., P.W. Shaw and D. Morritt, 2009. Prevalence and seasonality of Hematodinium (Alveolata: Syndinea) in a Scottish crustacean community. ICES J. Marine Sci., 66: 1837-1845. Heath, D.J., 1976. The distribution and orientation of epizoic barnacles on crabs. Zool. J. Linn. Soc., 59: 59-67. Holt, E.W.L., 1890. Foreign substances attached to crabs. Nature, 41: 463-464. Hood, M.A. and S.P. Meyers, 1973. The biology of aquatic chitinoclastic bacteria and their chitinoclastic activities. La. Mer., 11: 213-229. Hose, J.E., G.G. Martin., S. Tiu and N. McKrell, 1992. Patterns of hemocyte production and release throughout the moult cycle in the penaeid shrimp Sycionia ingentis. Biol. Bull., 183: 185-189. Ingle, R.W., 1996. Shallow Water Crabs. In: Synopses of the British Fauna, Bames, R.S.K. and J.H. Crothers, (Eds.). Field Studies Council, UK. Islam, M.N., M.A. Hossain and M.N. Ahsan, 2007. 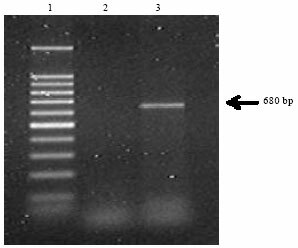 Development of a PCR based protocol for WSSV screening for major crustaceans inhabiting in cultured shrimp farm. Int. J. Sustain. Crop Prod., 2: 9-17. Johnson, P.T., 1983. Diseases Caused by Viruses, Rickettsiae, Bacteria and Fungi. In: Pathobiology. The Biology of Crustacea, Provenzano, A.J. (Ed.). Vol. 6, Academic Press, New York, USA., pp: 1-78. Knight-Jones, P. and E.W. Knight-Jones, 1977. Taxonomy and ecology of British spirorbidae (Polychaeta). J. Mar. Biol. Assoc. UK., 57: 453-499. Kopacek, P., M. Hall and K. Soderhall, 1993. Characterization of a clotting protein isolated from plasma of the fresh water crayfish Pacifastacus leniusculus. Eur. J. Biochem., 213: 591-597. Krishnika, A. and P. Ramasamy, 2012. Effect of water exchange to eliminate Vibrio sp. during the naupliar development of Artemia franciscana. J. Fish. Aquat. Sci., 7: 205-214. Lavilla-Pitogo, C.R. and L.D. de la Pena, 2004. Diseases in Farmed mud Crabs Scylla spp. : Diagnosis, Prevention and Control. Aquaculture Dept., Southeast Asian Fisheries Development Center, Philippines, ISBN: 9789718511718, Pages: 89. Lavilla-Pitogo, C.R., H.S. Marcial, S.A.G. Pedrajas, E.T. Quinitio and O.M. Millamena, 2001. Problems associated with tank-held mud crab (Scylla spp.) broodstock. Asian Fish. Sci., 14: 217-224. Lee, S.Y. and K. Soderhall, 2002. Early events in crustacean innate immunity. Fish Shellfish Immunol., 12: 421-437. Lo, C.F., C.H. HO, S.E. Peng, C.H. Chen and H.C. Hsu et al , 1996. White spot syndrome baculovirus (WSBV) detected in cultured and captured shrimp, crabs and other arthropods. Dis. Aquat Org., 27: 215-225. Lorenzon, S., S. De Guarrini, V.J. Smith and E.A. Ferrero, 1999. Effects of LPS injection on circulating haemocytes in crustaceans in vivo. Fish Shell Immunol., 9: 31-50. Martin, G.G., J.E. Hose, M. Choi, R. Provost, G. Omori, N. McKrell and G. Lam, 1993. Organization of hematopoietic tissue in the intermoult lobster Homarus americanus. J. Morphol., 216: 65-78. Messick, G.A. and J.D. Shields, 2000. Epizootiology of the parasitic dinoflagellate Hematodinium sp. in the American blue crab Callinectes sapidus. Dis. Aquat. Org., 43: 139-152. Messick, G.A., 1994. Hematodinium perezi infections in adult and juvenile blue crabs Callinectes sapidus from coastal bays of Maryland and Virginia, USA. Dis. Aquat. Org., 19: 77-82. Meyers, T.R., C. Botelho, C.M. Koeneman, S. Short and K. Imamura, 1990. Distribution of bitter crab dinoflagellate syndrome in southeast Alaskan Tanner crabs Chionoecetes bairdi. Dis. Aquat. Org., 9: 37-43. Meyers, T.R., T.M. Koeneman, C. Botelho and S. Short, 1987. Bitter crab disease: A fatal dinoflagellate infection and marketing problem for Alaskan Tanner crabs Chionoecetes bairdi. Dis. Aquat. Org., 3: 195-216. Najiah, M., M. Nadirah, I. Sakri and F. Shahrom-Harrison, 2010. Bacteria association with wild mud crab (Scylla serrata), from Setiu wetland, Malaysia with emphasis on antibiotic resistance. Pak. J. Biol. Sci., 13: 293-297. Noga, E.J., R. Smolowitz and L.H. Khoo, 2000. Pathology of shell disease in the blue crab, Callinectes sapidus Rathbun, (Decapoda: Portunidae). J. Fish Dis., 23: 389-399. Nyhlen, L. and T. Unestam, 1980. Wound reactions and Aphanamyces astaci growth in crayfish cuticle. J. Invertebr. Pathol., 36: 187-197. Persson, M., L. Cerenius and K. Soderhall, 1987. The influence of the freshwater crayfish Pacifastacus leniusculus Dana, to the parasitic fungus Aphanomyces astaci. J. Fish Dis., 10: 471-477. Porter, L., M. Butler and R.H. Reeves, 2001. Normal bacterial flora of the spiny lobster Panulirus argus and its possible role in shell disease. Mar. Freshwater Res., 52: 1401-1405. Prince, D.L., R.C. Bayer and M. Loughlin, 1993. Etiology and microscopy of shell disease in impounded American lobsters, Homarus americanus. Bull. Aquacult. Assoc. Can., 93: 87-89. Rajendran, K.V., K.K. Vijayan, T.C. Santiago and R.M. Kroll, 1999. Experimental host range and histopathology of white spot syndrome virus (WSSV) infection in shrimp, prawns, crabs and lobsters from India. J. Fish. Dis., 22: 183-191. Ravichandran, S., G. Ramesh Kumar and T. Balasubramanian, 2010. Infestation of isopod parasites in commercial marine fishes. J. Parasit. Dis., 34: 97-98. Ravichandran, S., G. Rameshkumar and J.P. Trilles, 2011. New records of two parasitic cymothoids from Indian fishes. J. Parasit. Dis., 35: 232-234. Ravichandran, S., K. Kumaravel, G. Rameshkumar and T.T. AjithKumar, 2010. Antimicrobial peptides from the marine fishes. Res. J. Immunol., 3: 146-156. Ravichandran, S., S. Wahidulla, L. D'Souza and G. Rameshkumar, 2010. Antimicrobial lipids from the hemolymph of brachyuran crabs. Applied Biochem. Biotechnol., 162: 1039-1051. Renouf, L.P.W., 1932. Xantho incisus Leach and Cancer pagurus L. infested with Sacculina carcini thompson on the south coast of Co. Cork. Ann. Mag. Natl. Hist., 10: 132-133. Rosen, B., 1970. Shell Disease of Aquatic Crustaceans. In: A Symposium on Diseases of Fishes and Shellfishes, Snieszko, S.F. (Ed.). American Fisheries Society, Washington, DC., pp: 409-415. Sawyer, T.K., 1991. Shell disease in the Atlantic rock crab, Cancer irrorauts, 1817, from the North Eastern United States. J. Shellfish Res., 10: 495-497. Sharmila, J.F.R., 2011. Molecular identification and secondary infection of shell disease in the mangrove crab Neoepisesarma mederi H. Milne Edwards (1953). M.Phil. Thesis, Department of Marine Biotechnology, Annamalai University, India. Shields, J.D. and C.M. Squyars, 2000. Mortality and hematology of blue crabs, Callinectes sapidus, experimentally infected with the parasite dinoflagellate Hematodinium perezi. Fish Bull., 98: 139-152. Shields, J.D., 1994. The parasitic dinoflagellates of marine crustacea. Ann. Rev. Fish Dis., 4: 241-271. Sindermann, C.J. and D.V. Lightner, 1988. Disease Diagnosis and Control in North American Marine Aquaculture. 2nd Edn., Elsevier, New York, USA. Sindermann, C.J., 1989. The shell disease syndrome in marine crustaceans. NOAA Technical Memorandum NMFS-F/NEC, Woods Hole, MA. Sizemore, R.K., R.R. Colwell. H.S. Tubiash and T.E. Lovelace, 1975. Bacterial flora of the hemolymph of the blue crab, Callinecetes sapidus: Numerical taxonomy. Appl. Microbiol., 29: 393-399. Smith, V.J. and K. Soderhall, 1983. B-1,3-glucan activation of crustacean hemocytes In vitro and In vivo. Biol. Bull., 164: 299-314. Smith, V.J. and N.A. Ratcliffe, 1980. Host defense reactions of the shore crab, Carcinus maenas L., clearance and distribution of injected particles. J. Mar. Biol. Assoc., 60: 89-102. Smith, V.J. and P.A. Johnston, 1992. Differential haemotoxic effect of PCB congeners in the common shrimp, Crangon crangon. Comp. Biochem. Physiol. Part C: Pharmacol. Toxicol. Endocrinol., 101: 641-649. Smith, V.J., K. Soderhall and M. Hamilton, 1984. &Bete;-1,3-glucan induced cellular defence reactions in the shore crab, Carcinus maenus. Comp. Biochem. Physiol., Part A: Mol. Integr. Physiol., 77: 635-639. Smolowitz, R.M., R.A. Bullis and D.A. Abt, 1992. Pathologic cuticular changes of winter impoundment shell disease preceding and during intermolt in the American lobster, Homarus americanus. Biol. Bull., 183: 99-112. Stentiford, G.D. and J.D. Shields, 2005. A review of the parasitic dinoflagellates Hematodinium species and Hematodinium-like infections in marine crustaceans. Dis. Aquat. Organ., 66: 47-70. Stentiford, G.D., M. Evans, K. Bateman and S.W. Feist, 2003. Co-infection by a yeast-like organism in Hematodinium-infected European edible crabs Cancer pagurus and velvet swimming crabs Necora puber from the English Channel. Dis. Aquat. Org., 54: 195-202. Stentiford, G.D., M. Green, K. Bateman, H.J. Small, D.M. Neil and S.W. Feist, 2002. Infection by a Hematodinium-like parasitic dinoflagellate causes Pink Crab Disease (PCD) in the edible crab Cancer pagurus. J. Invertebr. Pathol., 79: 179-191. Stewart, J.E., 1993. Infectious Diseases of Marine Crustaceans. In: Pathobiology of Marine and Estuarine Organisms, Couch, J.A. and J.W. Fournie (Eds.). CRC Press, Boca Raton, FL., pp: 319-342. Sudhakar, M., K. Raja, G. Anathan and P. Sampathkaumar, 2011. Compositional characteristics and nutritional quality of Podopthalmus vigil (Fabricius). Asian J. Biol. 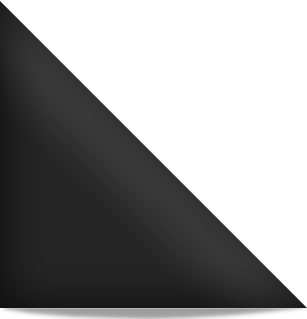 Sci., 4: 166-174. Takahashi, Y., T. Itami and M. Kondo, 1995. Immunodefense system of crustaacea. Fish Pathol., 30: 141-150. Trilles, J.P., S. Ravichandran and G. Rameshkumar, 2011. A checklist of the Cymothoidae (Crustacea, Isopoda) recorded from Indian fishes. Acta Parasitol., 56: 446-459. Ueda, R., H. Sugita and D. Yoshiaki, 1993. Microflora in the hemolymph of the Japanese coastal crustacea. Nippon Suisan Gakkaishi, 59: 1637-1637. Veeruraj, A., S. Ravichandran and G.R. Kumar, 2008. Antibacterial activity of crab haemolymph on clinical pathogens. Trends Applied Sci. Res., 3: 174-181. Vogan, C.J., J.P. Llewellyn and A.F. Rowley, 1999. Epidemiology and dynamics of shell disease in the edible crab Cancer pagurus: A preliminary study of England Bay, Swansea, UK. Dis. Aquat. Org., 35: 81-87. Vogan, C.L. and A.F. Rowley, 2001. Effects of shell disease syndrome on the haemocytes and humoral defences of the edible crab, Cancer pagurus. Aquaculture, 205: 237-252. Vogan, C.L., C. Costa-Ramos and A.F. Rowley, 2002. Shell disease syndrome in the edible crab, Cancer pagurus-isolation, characterization and pathogenicity of chitinolytic bacteria. Microbiology, 148: 743-754. Weis, J.S., R. Cohen and J.K. Kwiatkowski, 1987. Effects of diflubenzuron on limb regeneration and molting in the fiddler crab, Uca pugilator. Aquat. Toxicol., 10: 279-290. Young, J.S. and J.B. Pearce, 1975. Shell disease in crabs and lobsters from New York bight. Mar. Pollut. Bull., 6: 101-105. Young, J.S., 1991. Prevalence and severity of shell disease among deep-sea red crabs (Chaceon quinquedens, Smith 1879) in relation to ocean dumping of sewage sludge. J. Shellfish Res., 10: 499-503.